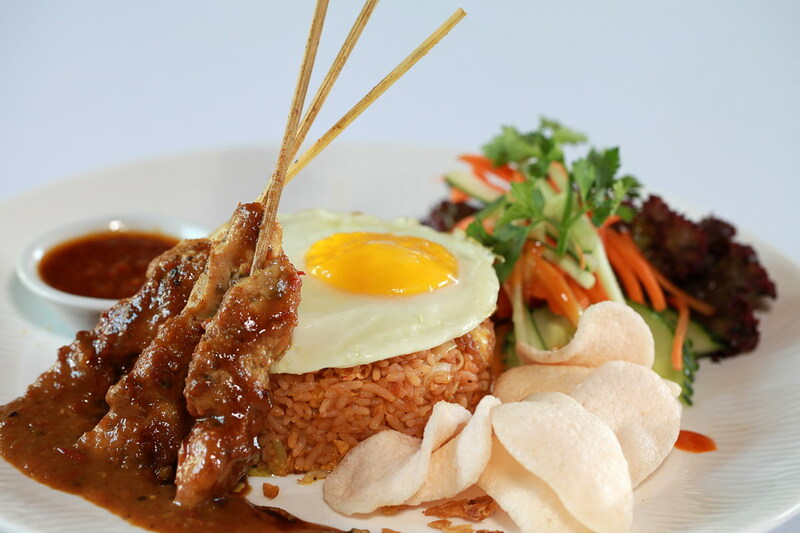 Nasi goreng, literally meaning Fried Rice in Bahasa and refers to fried pre-cooked rice, typically spiced with kecap manis (sweet soy sauce), sambal Ulek, shallots, garlic and canalso include other ingredients, particularly egg, chicken, prawns and a variety of vegetables. There is also another kind of nasi goreng which is made with ikan asin (salted dried fish) which is also popular across Indonesia. “Fried Rice” can be found in one version or another through out Asia but Nasi goreng is truely the national dish of Indonesia eaten at any time of the day from road side hawker carts to 5 star restaurants and every day at home. 2. add the prawn and chicken continue to sauté then add all vegetables. 3. when the vegetable start to wilt add the rice and bring the fireto high and continue to stir. 5. finish with fried shallot. 1. sauté all ingredients except the lime leaves until tender and soft. 3. sauté again with lime leaves until the oil separated and the color are red.